If anyone were seeking my advice about living in Colorado, amongst the topics I would address would be the weather. One thing that differentiates Colorado’s day-to-day life from life in many other places is how significant of an impact weather can have on daily activities, and how imperative it is that Colorado residents pay attention to weather and weather changes. Colorado, being an outdoor oriented place with significant weather changes on many different time scales, is a place where residents find their plans impacted by weather significantly more often than in most other places. Today was one of those days. Weather forecasts called for significant thunderstorm chances along the Front Range of the Rocky Mountains starting at 2:00. This is not too terribly uncommon for this time of year. As a result, it is a fairly common practice to begin all hikes in the mountains at this time of year early in the morning. This lead me to wake up at 6 AM in order to complete the 9.6 mile round trip hike of Bergen Peak prior to the anticipated onset of thunderstorms. The frequency in which people begin their activities early has implications beyond those activities. It is fairly certain that a significant number of people forgo Friday and Saturday night activities in anticipation of early morning hikes. Some even head up to the mountains the evening prior to their anticipated activity in order to save time. The end result; less people out at bars and more people at cabins and campgrounds on any given Friday or Saturday night at this time of year. Getting to this trail-head is actually quite easy from Denver. Overall, the drive takes less than an hour, and it does not require any off-road type driving. While the best route is along Interstate 70, the exit is far enough East that one could drive here from Denver without contending with the parts of the highway farther into the mountains where weekend traffic delays are common. 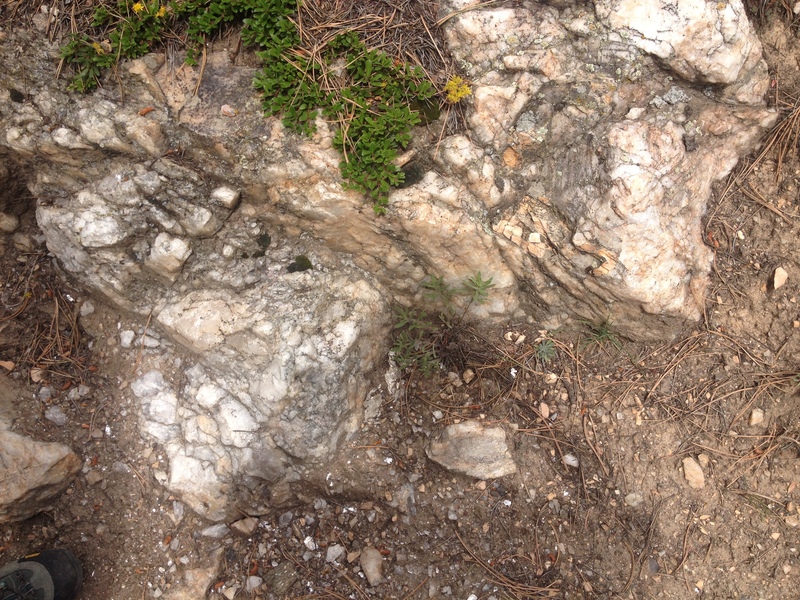 This hike is both moderate in intensity (elevation gains and such), and quite well marked. 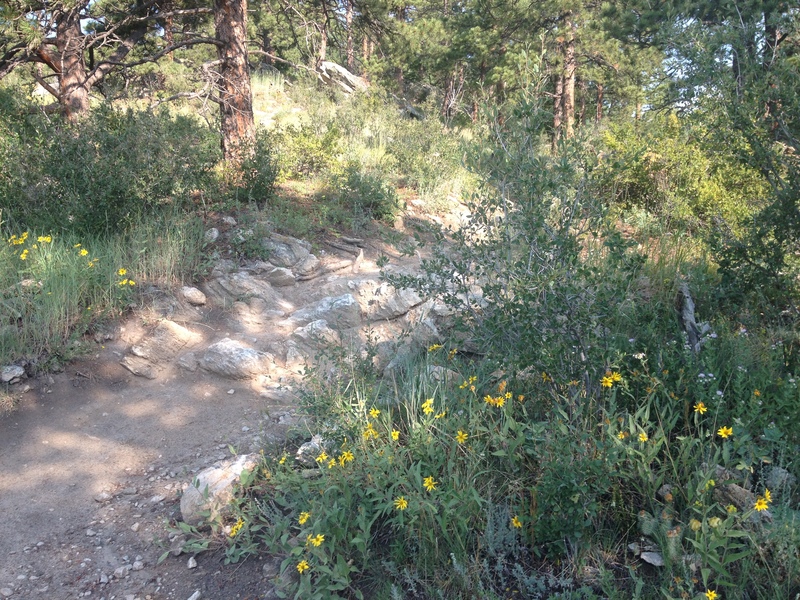 This is possibly because the trail is often open to, and is quite popular with, mountain bikers. 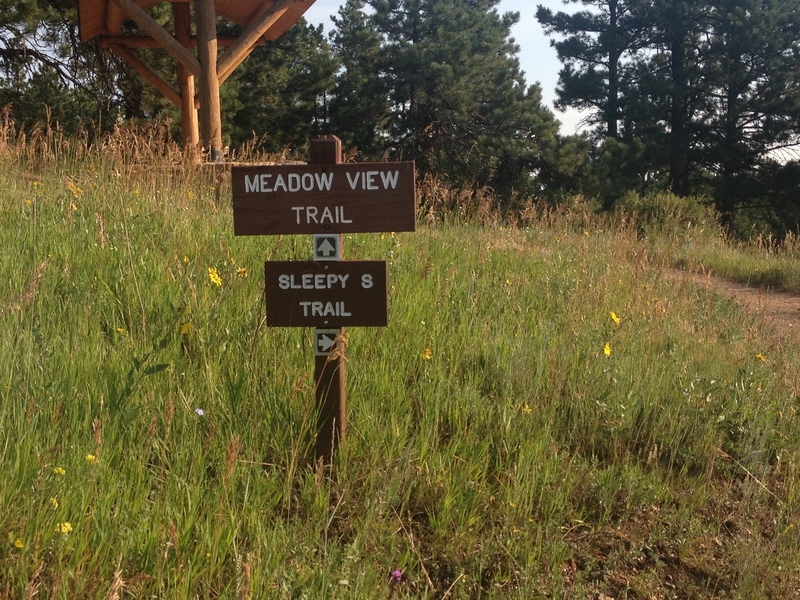 The first mile from the parking lot, along the Meadow View trail was fairly flat. This trail connected us with a loop that consisted of the Bergen Peak Trail and the Too Long Trail. 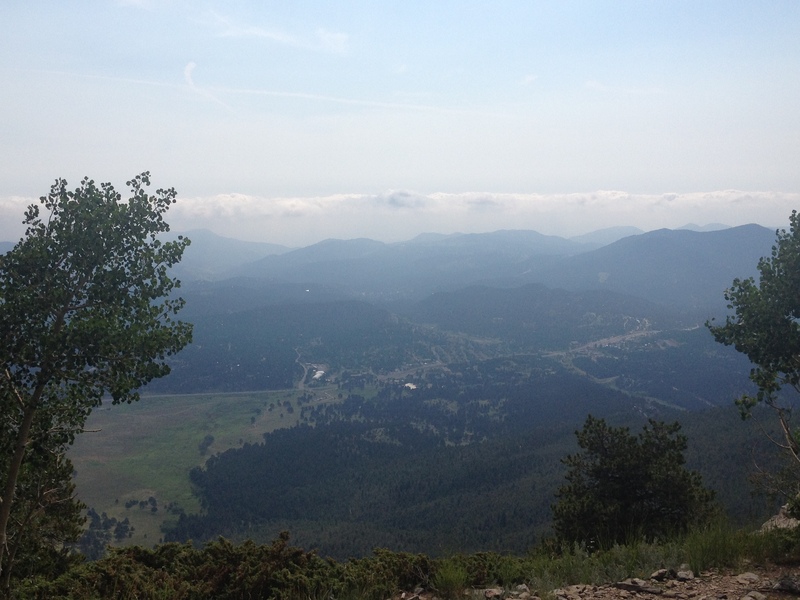 We decided to take the loop in a clockwise direction, starting with the Bergen Peak Trail. 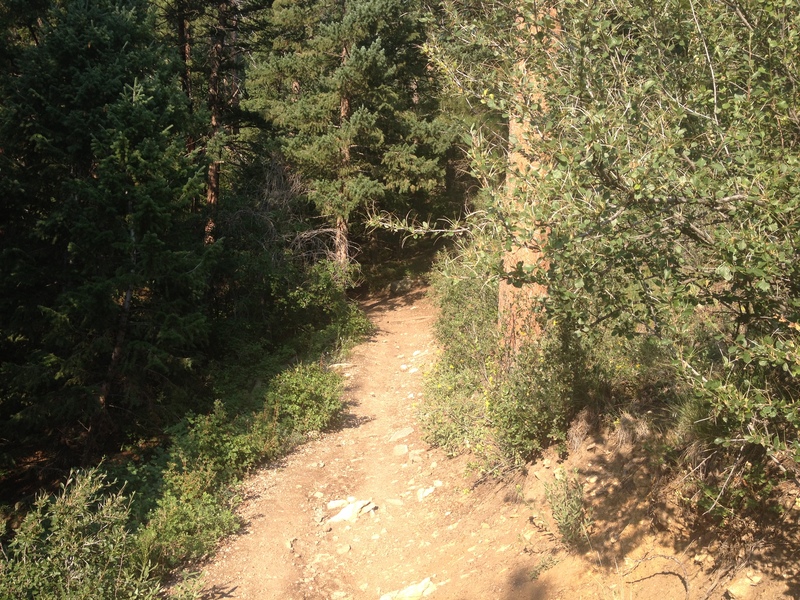 This trail took us up some steeper areas, as well as some areas of densely packed trees. 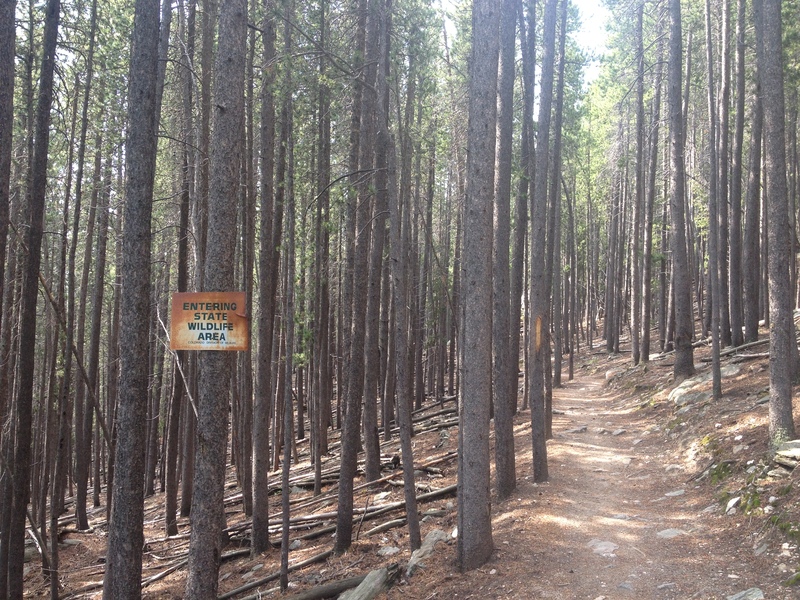 The occasional opening along the trail was marked with a sign indicating a “scenic view”. These scenic views were pretty nice, but on this particular day, our visibility was limited by a significant amount of haze. Once again, life was being impacted by weather, but this time a longer-term trend. 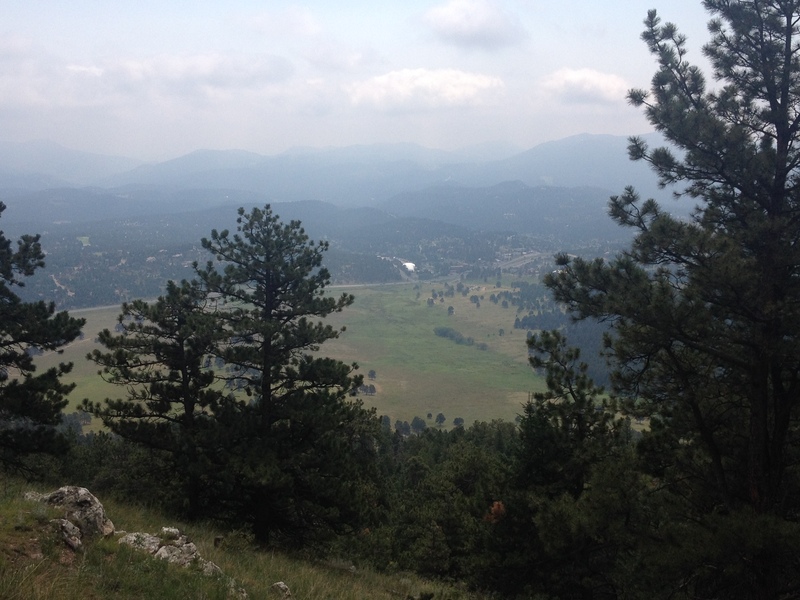 This summer has been more humid than is typical for Colorado standards, leading to significantly more haze than normal. A one mile spur off of the main “loop” brought us to the top of Bergen Peak a little bit after 10 AM. By this time, the skies had gotten even more hazy. 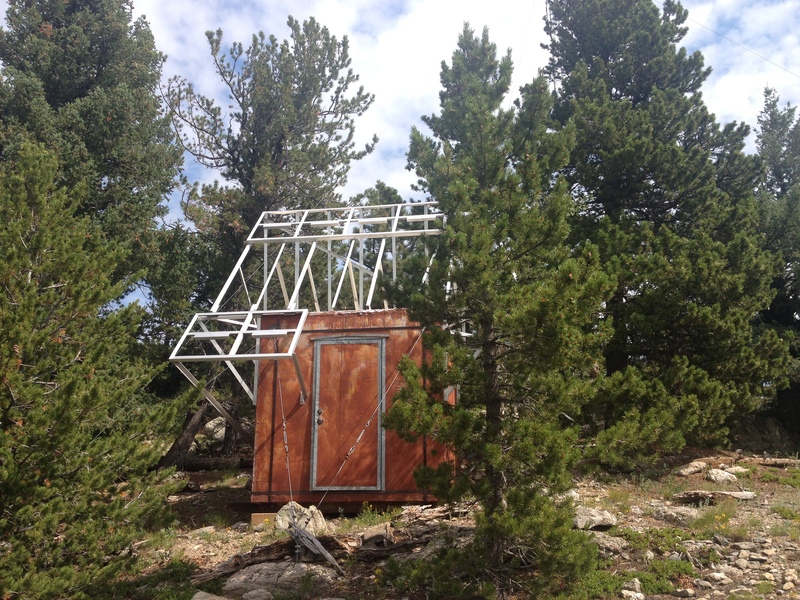 At the top of the mountain, there is some kind of tower (most likely for phones), as well as this sort of random building. I really do not know what it is for, and I was unable to enter the building. I really hope it is not home to some crazy recluse making secret revenge plans. Nothing good would come of that. Continuing the loop, we took the Too Long Trail, which felt as if it was living up to its name. 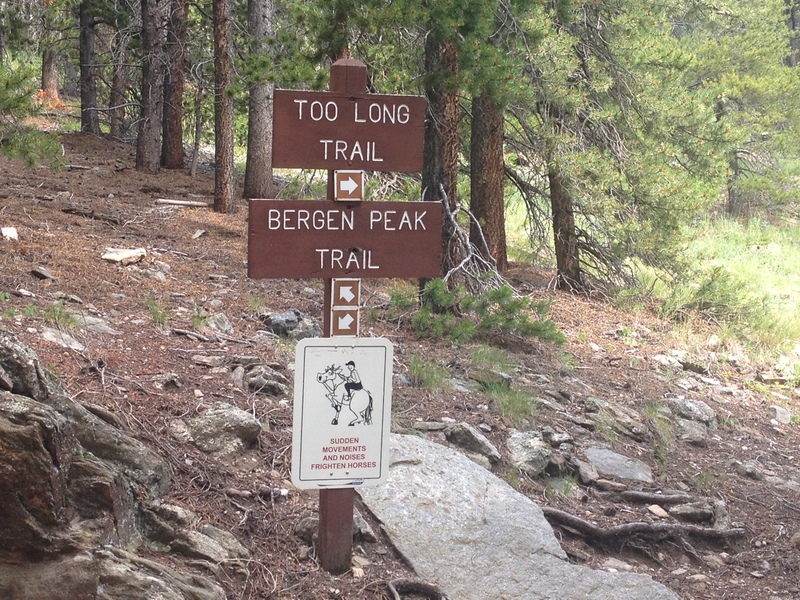 The trail itself is listed as only 2.4 miles, less than the 2.7 miles indicated for the Bergen Peak Trail. 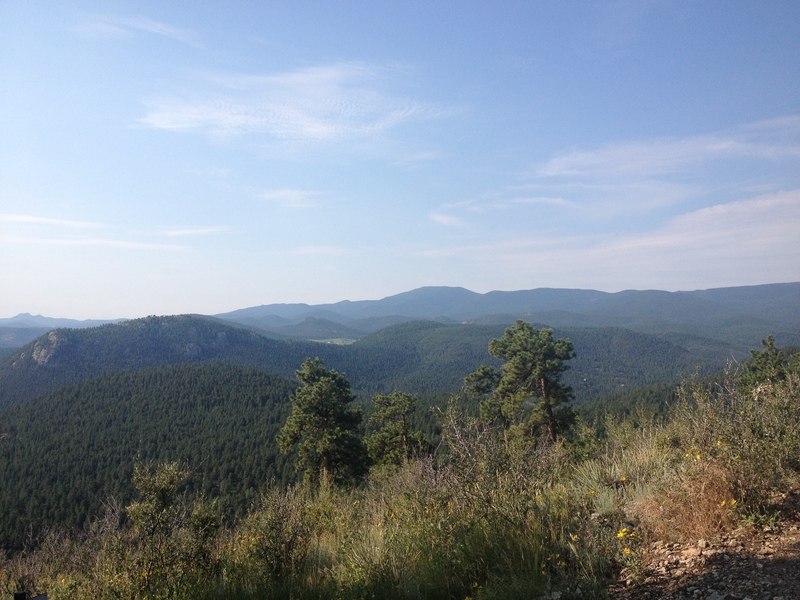 However, it felt a bit longer, as the trail was more of a semi-circle, and connected to another trail, called the Elk Meadow Trail. Along this trail, we were, indeed, closer to the meadow. 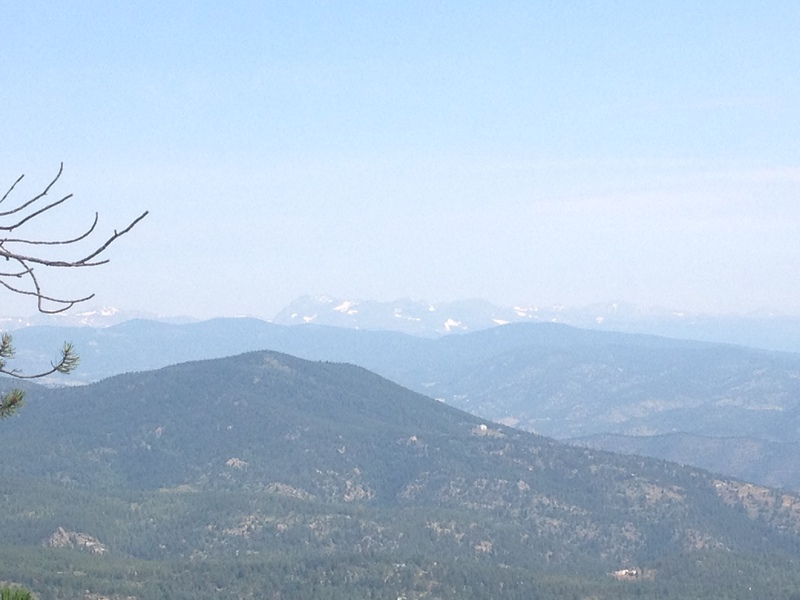 However, we did not see any Elk today. 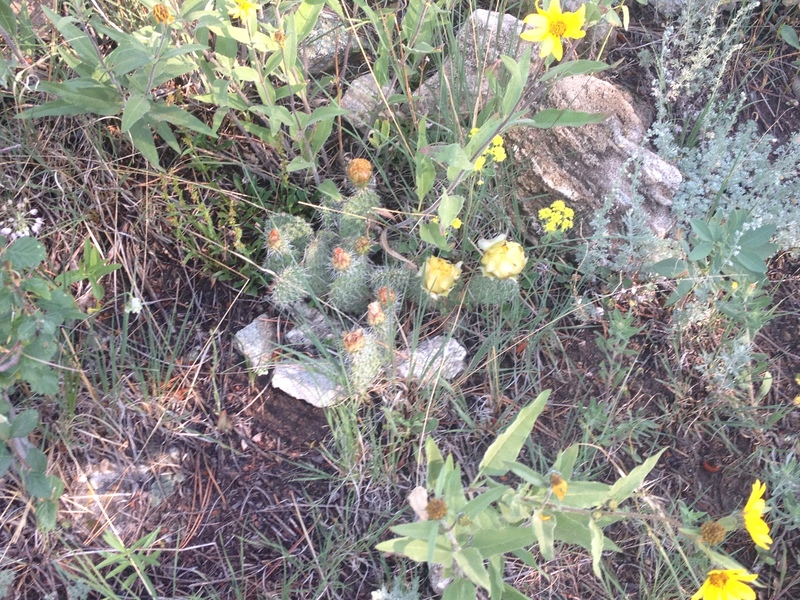 What we did see, though, were a significant number of different species of flowers, and some mica. 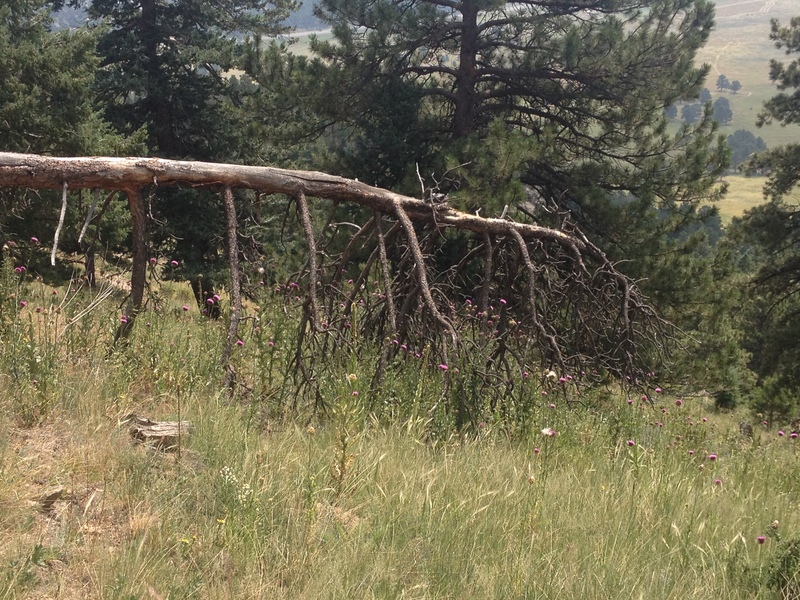 In one spot (pictured above), purple flowers were actually growing off of a dead tree branch. Quite amazing! I’m glad we took the Too Long Trail, even if it lengthened our hike to something close to 10 miles. 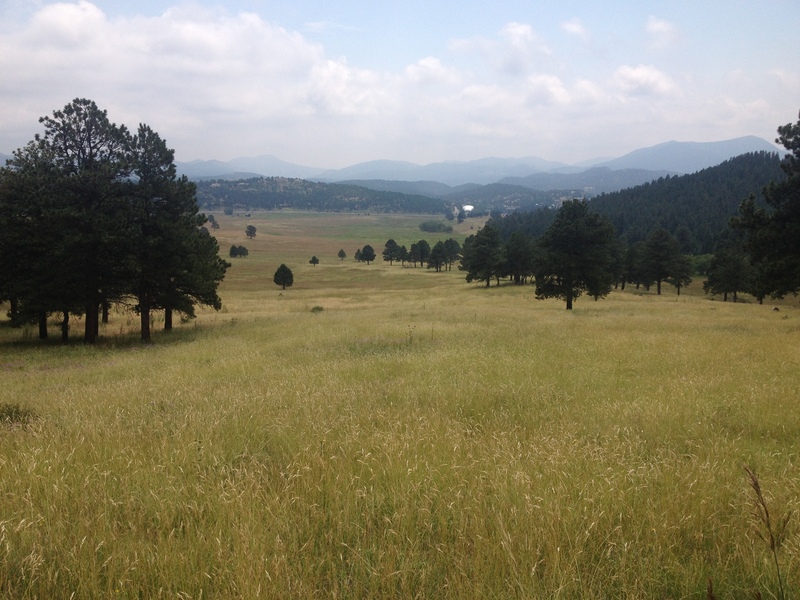 Not only did we actually experience why it is called Elk Meadow Park, but we also encountered the most unique find on this hike. 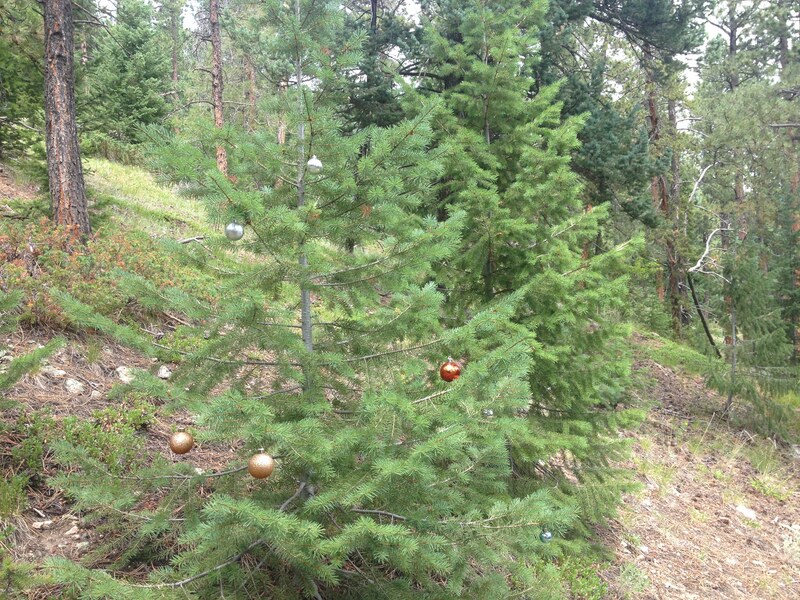 Apparently, someone felt it would be interesting to decorate one single tree, roughly halfway up the Too Long Trail, with Christmas decorations. It was just one tree, seemingly randomly selected, with roughly a dozen ornaments placed on it. For one with an imaginative mind, there are dozens of different scenarios that can be pondered that would lead to this outcome. But, even more so, I wonder what the people who operate the park think of all of this. And, I wonder how well it would be received if I were to return to this tree, and add a contribution of my own. If others have the same thoughts, what could this tree look like a year from now? While hiking this trail today, I did not believe I was going to get any good photos at all (due to the haze, and the tree density of most of the hike). However, the more I look a the photo I chose to lead this entry with, the more I fall in love with it! It is not the kind of perfect photo that you will find on commercials or billboards (see this image). It is a photo of the same place, but from a different perspective; one of a world that is not quite so perfect but beautiful in its own way. It is an image of a world where people wake at 6 AM to get in a hike before a round of thunderstorms that never materialized. It is a world where we know enough about what is in front of us to stay out of danger, but with enough haze to keep the excitement associated with the mystery of the unknown. That is the world in which we live in, and the frustration occasionally waking up early unnecessarily is a small price to pay for the wonder and the mystery that accompanies it. 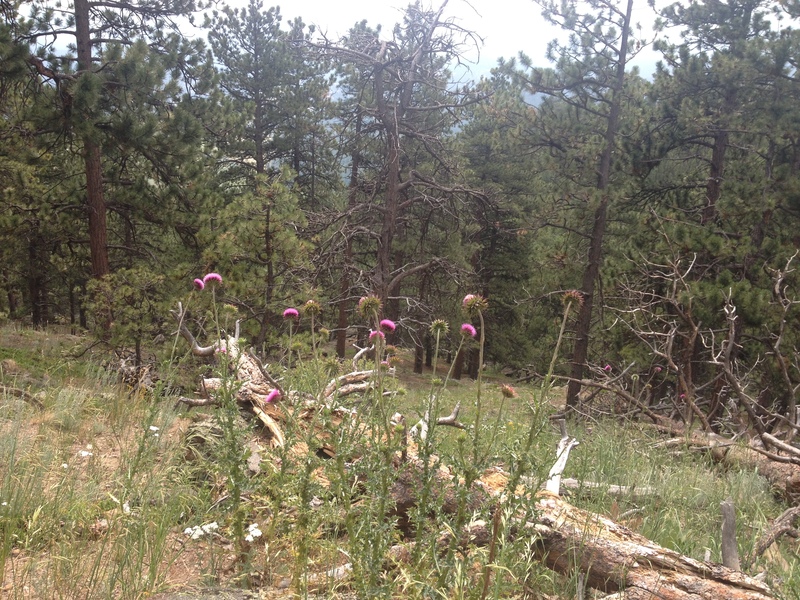 This entry was posted in Colorado, hiking, personal habbits, weather and tagged Bergen Peak, Christmas trees, Colorado, Elk Meadows Park, Evergreen, flowers, haze, Hiking, JeffCo on July 27, 2014 by Stephen Jaye.